Humpback Whales are without a doubt the most amazing creatures that migrate past our front door here at The Beach Resort Cabarita. These amazing and majestic giants of the deep make their presence known to us from May through to September every year. We are so very lucky to be on the edge of what they call The Humpback Highway. Cabarita Beach is superb for land based whale watching. No need to hop on a boat and head out to sea, at our resort simply open your blinds or walk out on your balcony and there they are – incredible! Take a stroll on the beach or a lovely walk up to the lookout at Norries Headland, it takes just 10 minutes and you have a superb view of not only the whales, but of the stunning coastline up to Kingscliff in the north and down to Hastings Point to the south. Under the Environment Protection and Biodiversity Conservation Act 1999 Humpback Whales are protected here in Australia, and thus their numbers have steadily increased along the east coast giving us a long and jam packed viewing season each year. The most active of the whale species, the humpbacks can often be seen breaching and rolling quite close to the coast, making for fantastic photo opportunities. 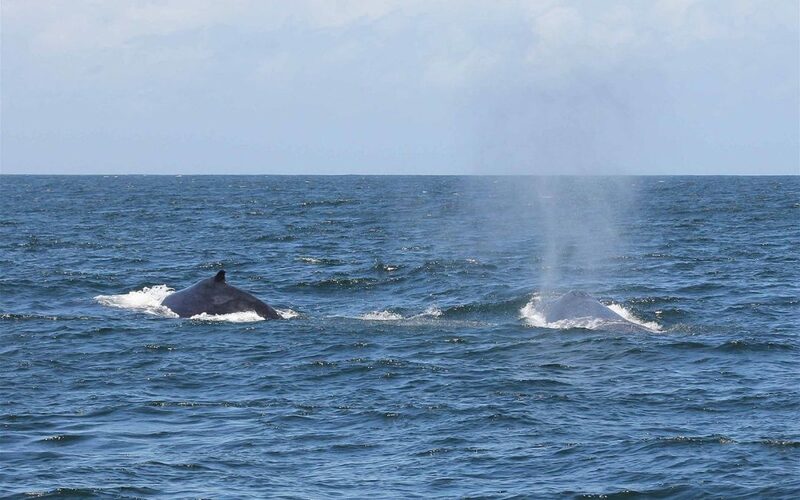 If you do take the option of ocean based whale watching, be sure to book a trip with an operator that offers audio. The whale song is the most incredible sound. For years researchers have been studying these sounds made by males Humpbacks only, and most commonly during mating season. Incredibly the song changes between seasons – sometimes only slight or subtle changes occur, and other times it is completely different. No matter what the changes are, all singers in the region at that time will adopt the same changes and sing the same song. Why? No one knows. It remains a wonderful mystery. Growing up to 15 metres in length and weighing up to 40 tonnes, the females are travelling past us to reach the warmer waters of The Great Barrier Reef to give birth. They will then travel back down the coast stopping to rest the calves at Hervey Bay, before again passing Cabarita on their journey home to Antarctica between August and September. How lucky we are to be a part of this remarkable event each year. No matter how many times I walk out and see that familiar spray, or hear the echo across the ocean of the “whack” as a huge Humpback hits the water after breaching, it still makes me smile and stop to watch, and to always remember how lucky we are to live with these creatures for a few short months every year. Book your stay at The Beach Cabarita now and enjoy the whale watching from our beautiful piece of paradise.